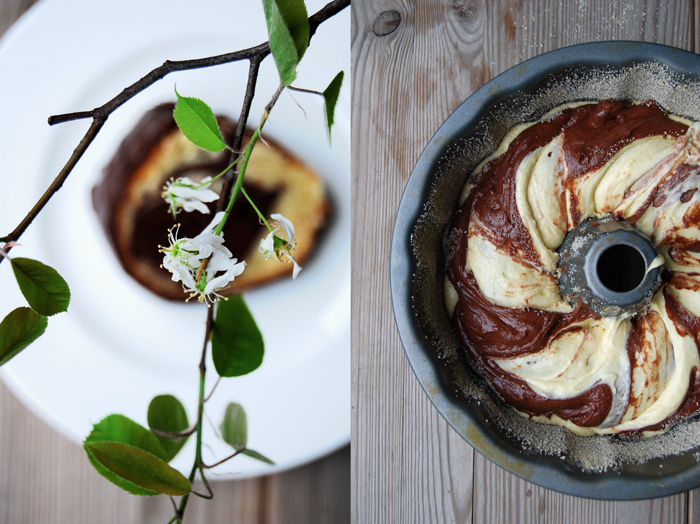 My favourite marble cake needs 6 eggs to turn into a bundt cake so fluffy and juicy, light and enjoyable that I just can’t stop eating it. 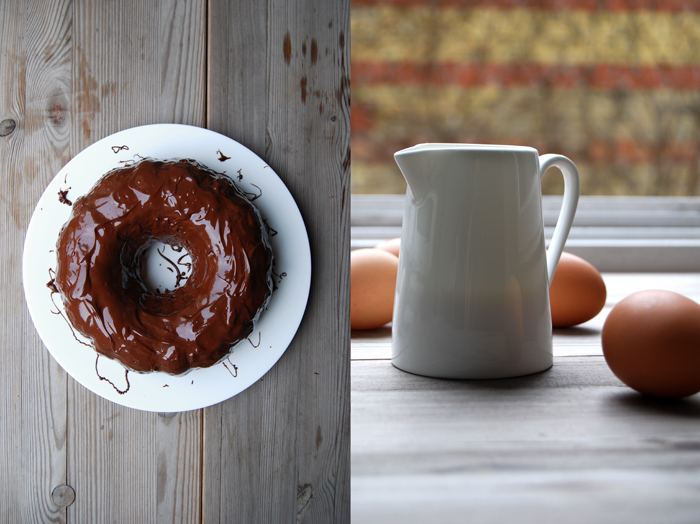 Most of the time I just sprinkle it with icing sugar but some days ask for more. When I’m in a chocolaty mood I cover it in a crunchy layer of bittersweet chocolate. This cake is so simple but whenever I hold a slice of it in my hand and take the first bite I ask myself why I don’t bake it more often. It’s a typical childhood cake, a birthday party classic which had to be on every coffee table. It’s also the cake my mother used to bake for my own special day. In the morning, I used to find it on my birthday table together with all my presents and it always had my name and age written on it, with colourful smarties pushed into the glossy chocolate. Two year’s ago I baked it for the first time for our godchild’s first birthday, with smarties of course to continue the tradition. Set the oven to 180°C / 355°F (fan-assisted oven). Butter a bundt pan and sprinkle with bread crumbs. Whisk the egg whites with the salt and 1 tablespoon of the sugar till stiff. Combine the flour and baking powder in another bowl. In a big bowl, mix the butter, sugar and vanilla till fluffy. Add the egg yolks and continue mixing till thick, creamy and light yellow. Add the milk and mix until well. Fold the egg whites and the flour with a wooden spoon gently into the butter and egg mixture, alternating, 1/3 at a time, combining well in between. 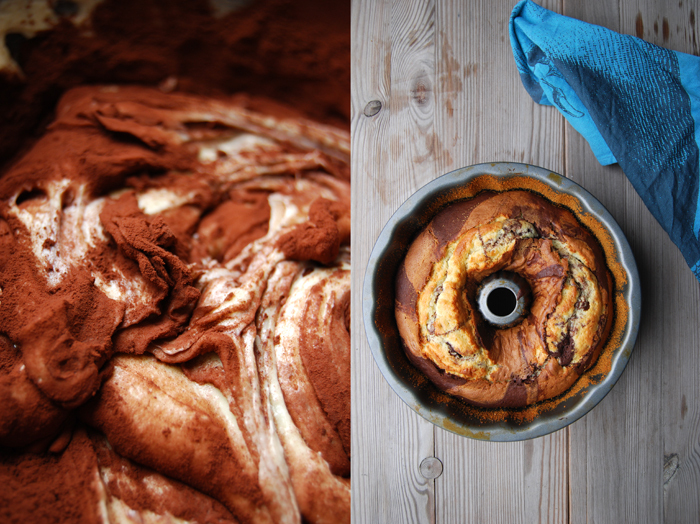 Scrape half of the dough into the bundt pan and stir the cocoa powder into the remaining batter. Dollop the dark batter on top of the light one and swirl with a small fork through the 2 batters, carefully, from top to bottom pulling slowly all the way around the pan. Don’t over mix the different batters to keep the marble pattern. Bake for 40 minutes or until golden and spongy. Check with a skewer, it should come out clean. Let the cake cool for 2-3 minutes before you turn it around onto a wire rack to cool completely. 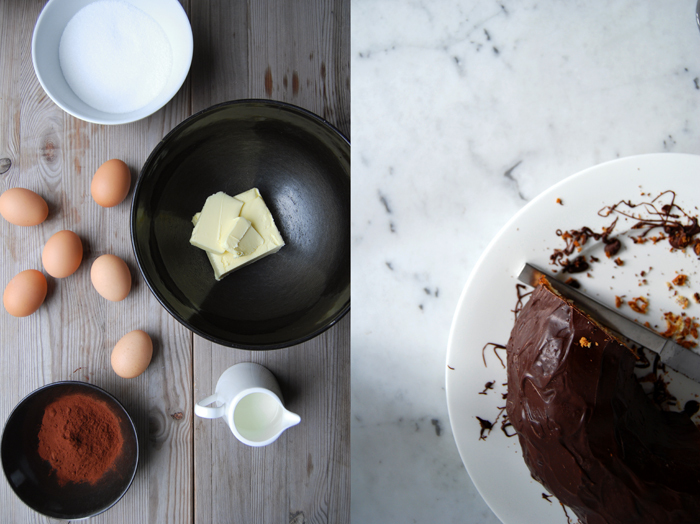 Melt the chocolate and mix in 1 tablespoon of butter, let it cool for 2 minutes before you drizzle it over the cake. Spread it or leave it sprinkly, as you like. Mir gefällt die Bundtform, die du für deinen Marmorkuchen verwendet hast, ausgesprochen gut. Verrätst du mir das Fabrikat und wo man sie bekommt? Hallo Melanie, ich habe die Form vor über 10 Jahren gekauft und weiß leider nicht mehr wo, es tut mir leid 🙁 Es steht auch nichts weiteres auf der Form, es war also keine bekannte Marke. Danke für die schnelle Rückmeldung. 🙂 Ich werde bestimmt etwas ähnliches finden. Dein Blog ist fantastisch. Kann mich immer nur schwer entscheiden, was ich als nächstes ausprobieren möchte, weil mich soooo vieles “anlacht”. Freue mich schon auf vieeeeele weitere leckere Rezepte und lese Deine Posts sehr gerne! Du kannst mir gerne berichten, wie du den Spargel und die Auberginen Röllchen fandest! Ich bin gespannt und freue mich immer über Feedback!! Just beautiful. 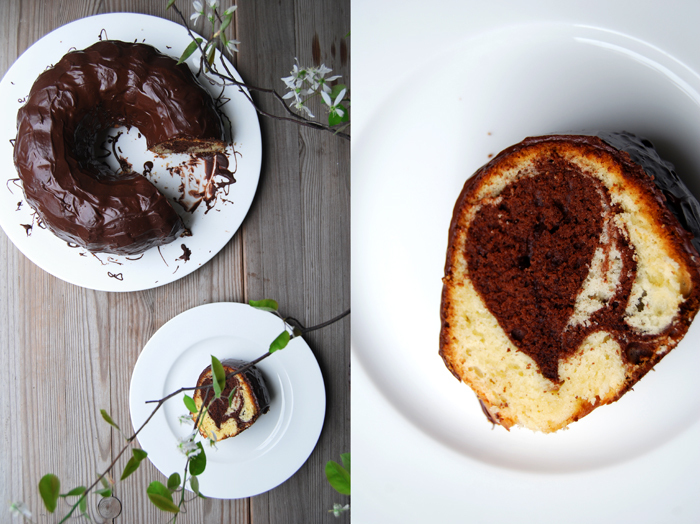 I’m still craving a delicious marble cake after having a lackluster grocery store slice at a baby shower yesterday. Thank you for making recipes look so simple and wonderful.